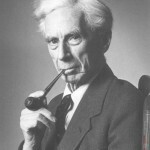 To be honest, I suppose I’ve always secretly written off Bertrand Russell as a bit of a hippy… Sure, he was one of the great 20th century thinkers; a Nobel prize winning philosopher and mathematician, and a passionate political activist. He’s undoubtedly the only person to have both dined with Gladstone and been arrested for protesting the Vietnam war. But part of me still reckons him a hopeless ingenue, an Oxbridge Bob Marley if you like. Maybe that’s why I’m so adamant that this extract from his 1956 autobiography would work better as a sample on one of those Ibiza chill-out compilations, so popular with monged-up idiots at 5am. Anyone who’s their minds blown by the cod-profundity of Scrubulous Pip or Faithless, say, would surely have their socks knocked into next Christmas by Russell’s genuinely profound ruminations on the passions that stirred his incredible life. “I have sought love, first, because it brings ecstasy – ecstasy so great that I would often have sacrificed all the rest of life for a few hours of this joy. I have sought it, next, because it relieves loneliness – that terrible loneliness in which one shivering consciousness looks over the rim of the world into the cold unfathomable lifeless abyss. “I have sought it finally, because in the union of love I have seen, in a mystic miniature, the prefiguring vision of the heaven that saints and poets have imagined. This is what I sought, and though it might seem too good for human life, this is what – at last – I have found. “With equal passion I have sought knowledge. I have wished to understand the hearts of men. I have wished to know why the stars shine. And I have tried to apprehend the Pythagorean power by which number holds sway above the flux. A little of this, but not much, I have achieved. “Love and knowledge, so far as they were possible, led upward toward the heavens. But always pity brought me back to earth. Echoes of cries of pain reverberate in my heart. Children in famine, victims tortured by oppressors, helpless old people a burden to their sons, and the whole world of loneliness, poverty, and pain make a mockery of what human life should be. I long to alleviate this evil, but I cannot, and I too suffer. Handwritten, dated 25 July 1956. Starts off poetic then goes into witty stories and reflections. Great stuff. “I allowed myself to reflect that urban New York in 1940 was exactly at the same point on the road to Enlightenment as rural England in 1868. But having made that remark I felt no further resentment”. Would love to hear about your own philosophy on life. I’m sure all your readers would too!